Mabel Ganson Evans Dodge Sterne Luhan was her full legal name, but for most of her life she was referred to more accurately as just “Mabel,” detached from the string of names that trailed behind hers. During her time in New York City between 1905 and 1918, she would go by Mabel Dodge despite living completely physically separated from her husband Edwin Dodge, who couldn’t keep up with Dodge’s boundless ambitions. So who was Mabel Dodge? Maybe history has forgotten how much Mabel Dodge really was because she is so difficult to define. To call her an “heiress” or a “patroness” does not come close to capturing the expansive impact Dodge had and continues to have on American Culture in the twenty and twenty-first Century. Tracing back the roots of everything from feminism to pop culture, Dodge seems to find herself entangled in the thick of it. Take Gertrude Stein’s famous phrase, “A rose, is a rose, is a rose is a rose.” The saying isn’t widely known to be hers. Stein wrote this in an early poem not widely distributed entitled “Sacred Emily”. Dodge was assisting Stein with her poetry at the time and Stein recounted that it was Dodge who said this to her. Following the progression of this phrase in American pop culture, its influence even surfaces in a recently popular graphic novel series called Scott Pilgrim when the protagonist recites the phrase verbatim. The author likely had no clue of the roots, seeing as the phrase bubbles up in all sorts of places from an album of Aretha Franklin’s to a Stephen King novel. The point isn’t that “a rose, is a rose, is a rose, is a rose,” has some deep meaning or impact. It’s an example of the “Mabel Dodge” effect. Dodge permeates popular culture, reform, and art in American society since she gave herself center stage in New York and somehow her name is lost in the shuffle. History might not recall her name, but it is surrounded by her impact. Dodge’s work just from her time in New York persists in birth control pills and Duchamp paintings on the walls of American museums. She’s there in union meetings and in crowds of striking factory workers on street corners. She’s handing out pamphlets on sexual liberation and meditating on the back porch. She’s hiding anarchists and posing in Renaissance garb for portraits. She’s writing plays and giving decorating advice. She’s fighting a war across the ocean that she still doesn’t have a vote for or against. She’s falling in love with a man again while still being enamored of humanity, as usual (Rudnick) (Dodge-Luhan). Mabel Dodge was more. More than a woman. More than an artist. More than a patron. More than a Bohemian. More than a reformer. More than history has remembered her as. Dodge was dauntless and terrified. She was cunning and frivolous. Romantic and stoic. Bertram Wolfe would say Dodge was “Wealthy, gracious, open-hearted, beautiful, intellectually curious, and quite without a sense of discrimination, she was Bohemia's most successful lion-hunter… Her hospitality, her capacity for listening, her quiet, encouraging smile, brought together the great, the near-great, and those who came to dream of greatness” (45). Wolfe is addressing Dodge’s charm while also diminishing her role by ending with Dodge’s description as “quite without a sense of discrimination.” Historians like Wolfe belittle Dodge’s contributions by focusing on her effusive public persona. Barbara Gelb would comment that “[S]he was not beautiful; she was completely humorless; and she was staggeringly conceited. But she managed by flattery, a superficial knowledge of the arts and politics, and lavish hospitality, to lure such disparate personalities to her gatherings” (58). Lincoln Steffens, one of her closest confidants and another success writer of in The Village, would write about her in his autobiography and comment, “’A cut flower,’ Hutchins Hapgood called her. With taste and grace, the courage of inexperience, and a radiating personality, that woman has done whatever it has struck her fancy to do, and put it and herself over-openly” (110). Ella Winter, journalist and activist in Greenwich Village in the early 20th century, would write in her own autobiography, “She [Dodge] was a strong, dominating woman who had always been wealthy and who used her money to make a personal bohemia” (95). Historian Daniel Flynn would crown Dodge “Queen of Greenwich Village” (180). To try to measure Dodge’s impact on American society is nearly impossible because Dodge doesn’t stick to one category: even analyzing her influence over the course of a decade is a task not near finished. Mabel Dodge’s work in New York City began with her own life long reach for “The New.” The New is exactly what it sounds like—new thought, new ideas, new art, new perspectives. Dodge wanted a violent surge forward from stoic Victorian influence. Gertrude Stein would say one evening talking to Dodge that the new century would be “a time when everything cracks, where everything is destroyed, everything isolates itself, it is a more splendid thing than a period where everything follows itself” (Rudnick 1100). During her time in New York City, Dodge unraveled her own prejudices and forced contemporaries of her time with opposing views to look at their own bias as well. Her gatherings and discussions at her house in Washington Square paired priests with sexual liberation leaders like Mina Loy and Margaret Sanger. She staged discussion about labor between anarchists like Emma Goldman and socialists like John Reed. She pushed to dismantle the influence “form” held over art with her dedication to modernism in visual arts, literature, and daily life. Not only did Dodge set a safe stage for discourse, but Dodge participated as a financial supporter, organizer, and creative contributor to some of the most radical ideas of early twentieth century America as well. Some movements like socialism and sexual liberations would eventually see her less protected peers thrown in prison. Though these categories represent only a snippet of her contributions, viewing her impact on the labor reform movement, women’s liberation movement, and establishment of the modern art scene in New York City displays a small portion of the range of impact Dodge had in all facets of her life. She was calculated and purposeful with her money as well as her mind. Her high class background gave her the unique position to disseminate the ideas of Bohemia out into the mainstream like no one else could. So who was Mabel Dodge? The best response so far seems to be that she was more. The more digging done to unearth the far reaches of newspaper articles and court proceedings only reveals the name “Dodge” is ever present. One newspaper article from 1920 out of Chicago would call Dodge “the most peculiar common denominator that society, literature, art and radical revolutionaries ever found in New York and Europe” (47). Only Dodge’s paper trail from magazines to half-hearted love letter can begin to describe the influence of a woman who used every ounce of her being to promote and explore everything and anything that pushed for the future. Gelb, Barbara. So Short a Time. New York: W W Norton & Co., 1973. Print. Rudnick, Lois. Mabel Dodge Luhan: New Woman, New Worlds (Kindle Locations 47-1101). University of New Mexico Press. Kindle Edition. Steffens, Lincoln. Autobiography. Berkeley: Heydey Books, 2006. Print. Winter, Ella. And Not to Yield. London: Harcourt, 1963. Print. 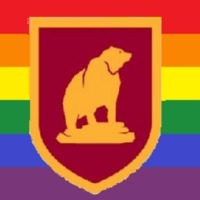 Welcome to Bears Make GSA History! 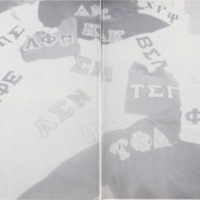 Our exhibit examines the history of the Gender Sexuality Alliance (formerly known as GALA) at Ursinus College, (located in southeastern Pennsylvania) from 1991 to 2000. Join us as we examine the discussions about, representations of, and controversies surrounding the formation and first ten years of the GSA, as seen in articles published in the school newspaper, The Grizzly. Genesis: GALA, 1991. Explore the formation and first semester of the Ursinus College GSA as it weathered visceral public defamation at the hands of a small but vocal group of students and professors. Conflict and Conversation: 1995. Examine continued debate about GALA, sexuality, and the LGBTQ+ community at Ursinus College. Several articles condemn the group, while many other voices advocate. LGBTQ+ Identities in Media, 2000: Explore representations of the LGBTQ+ community in popular culture in the New Millennium. Global: Connect the microhistory of local events with national trends. We would like to thank Ms. Carolyn Weigel, Mr. Andy Prock, Ms. Christine Ianicelli, and Drs. Throop and McShane for making this project possible. Ms. Weigel opened the Ursinusiana archives for our research, guiding our research processes by directing us to resources and contacts. Mr. Prock's expertise on scanning made the digitization of our project possible, while Ms. Ianicelli's technical knowledge gave us confidence in navigating Omeka. What is social life, who it has involved, and how have these social interactions changed over time at Ursinus College? This project specifically explores the reasons for the shift to coeducation, how and why women carved out their own spaces on campus, and finally the ways in which both men and women did and did not coexist in their social lives between 1880 and 1907. 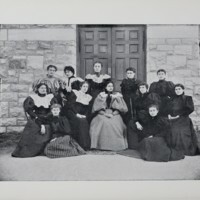 Materials from the Ursinusiana Collection and the Ursinus Archives, especially yearbooks, newspapers, and photographs, reveal the early years of social life at Ursinus for women. In particular, this project shows that women joining a newly coeducational school not only had to prove their academic worth, but also navigated the difficulties of social life by joining established spaces or creating their own through clubs, organizations, sports, housing, and other interactions. Hopefully, this project is not an end in itself, but rather, the beginning of further dialogue about our students’ diverse backgrounds and the ways that these backgrounds manifest in social experiences at Ursinus College. I would like to thank all the people who have helped me through this summer fellows project. Thank you to Dr. Susanna Throop and Dr. Kara McShane for being wonderful advisors and all the work they have done to make this project the best it could be. Thank you to Mrs. Carolyn Weigel and Mr. Andrew Prock for their amazing help in the archives and digitizing everything. And thank you to everyone else who have guided this project or assisted me in any way shape or form on this project. I appreciate all that you've done!